These Pet Rescue level 418 cheats and tips will help you beat level 418 of Pet Rescue. The objective of Pet Rescue level 418 is to save 4 pets and score 15,000 points. 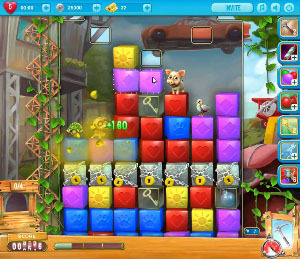 The board is divided into a few sections in Pet Rescue Saga level 418. The sections are blocked by locked blocks. In order to keep making your way down the board you will need to unlock these blocks. The keys to unlock the blocks are in glass boxes. The only way to break them is to drop them onto the locked blocks. Once they drop down, they will break free from the glass block. Grab the key to break open the blocks. In between the locked boxes you will have rows of color blocks. Look for large combinations to help you beat the level more effectively. Make sure you do not get stuck with blocks that do not match together. This will make it much more difficult to bring down the animals to the bottom. After you make a large combination, take a look around the board to see how it affected the remaining blocks. In this level you will be given the hammer booster rather than the rocket booster. The hammer booster can help you to remove a block out of your way. The hammer is a great tool to use if you have a block that is standing in your way of making a great combination or clearing one of the pets. The hammer booster should fill up twice in this level, if you use it fairly quickly.